VILLEROY & BOCH SUBWAY 2.0. 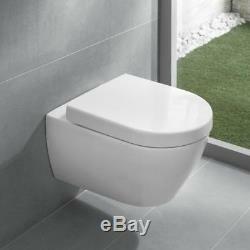 VILLEROY & BOCH WC wall hung SUBWAY 2.0 Pan with soft closing seat option. 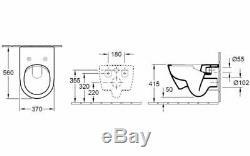 (for details and measurements please see the drawings in photo gallery). Beautiful in its minimalism, the Villeroy and Boch Subway range is one of the bestsellers, and it is easy to see why. Innovative continental design breaks away from the predictable, creating a product that is ultra-modern in both looks and functionality. Elegant curves blend seamlessly into the wall, with its wall-hung design instantly making an impression. Concealed fixings cleverly hide the mounting screws, leaving an unspoiled look. Product information: Collection: Subway 2.0 Finish Colour: White Alpine Installation type: Wall-hung Flushing system: Washdown Outlet type: Horizontal Dimension: Width 355mm (35.5cm) x Height 400mm (40cm) Projection from the wall: 560mm (56cm). 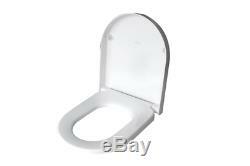 Manufacturing Product Numbers: 56001001 - 56cm pan 9M68S101 - 56cm seat. Feedback after receipt of your order would be very much appreciated - THANK YOU. Should you need an invoice with VAT stated separately, please get in touch or add a note to your order at the check-out. Every listing has various postal options from Signed for, Tracked 24H courier or Next Day by 10:30 (at additional cost if needed) for your convenience. You will have to cover the cost of posting the product back to us. Any product you return must be in the same condition you received it and in the original packaging with all labels that it came with. Any claims for short deliveries, damaged goods or incorrect items must be advised within 3 days of the receipt of goods. Under no circumstances we will be liable for any loss, damages or remedial expenses whether or consequently arising from the goods supplied for any purpose. Please be aware it is your responsibility to check the product detail and item specifics where the information is provided. If in doubt please get in touch befroe placing the order. While we endavour to ensure that the product info and specs are correct, we do not warrant the accuracy of the material on the listings. Producer specs can alter at any time and we endavour to note these changes but cannot be held responsible for alterations beyond our control. VILLEROY & BOCH WC PAN WALL HUNG SUBWAY 2.0 ---48cm (Compact) Pan with soft closing seat ---or ---56cm Pan with soft closing seat ---(for details and measurements please see the drawings in photo gallery) Beautiful in its minimalism, the Villeroy and Boch Subway range is one of the bestsellers, and it is easy to see why. 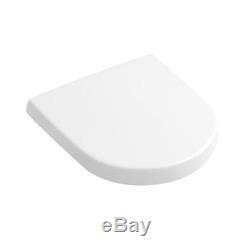 VILLEROY & BOCH SUBWAY 2.0 WC TOILET PAN WALL HUNG + V&B SOFT CLOSING WC SEAT. VILLEROY & BOCH WC PAN WALL HUNG SUBWAY 2.0. 48cm (Compact) Pan with soft closing seat. 56cm Pan with soft closing seat. Dimension: Width 355mm (35.5cm) x Height 400mm (40cm). Projection from the wall: 480mm (48cm) or 560mm (56cm). 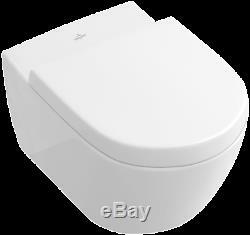 The item "VILLEROY & BOCH SUBWAY 2 WC TOILET 56cm WALL HUNG +V&B SOFT CLOSING SEAT option" is in sale since Sunday, January 20, 2019.